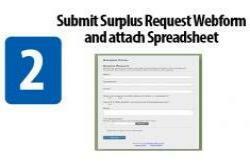 All surplus requests must be processed thru and approved by the College of A&S Dean's Office (Space and Facilities). Please follow instructions below to prepare for pick up. Once the Space and Facilities team receives and processes your request you will be contacted. You may be requested to provide a photo, additional details, or dimensions for posting on the University-wide swap site. Specific procedures apply to lab and medical equipment. To find information regarding these procedures please refer to the Environmental Health and Safety website here: http://ehs.uky.edu/. They will provide documentation to certify that the item is cleared for pick-up and removal. 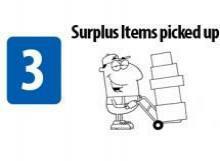 Do not submit the Surplus Property Pick-Up Request form until you receive the documentation from EHS. Disassemble or disconnect from power lines and/or walls. Empty all drawers of personal items, files, and trash. For desktop computers: place a request with College of A & S Help Desk/IT to have the hard drive pulled using the "Surplus" link under Hive forms here: https://resources.as.uky.edu/hive-forms. Once the hard drive has been removed please follow procedures below to submit your surplus request. 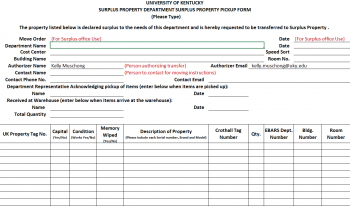 For laptops, iPads, and tablets: place a request with College of A & S Help Desk/IT to drop off items for surplus using the "Surplus" link under Hive forms here: https://resources.as.uky.edu/hive-forms. To be compliant with FERPA laws and follow asset accountability procedures it is very important that you do not leave these items in common hallways and unsecured areas of any building. Box or package small similar or like items that are not identified by property tags. 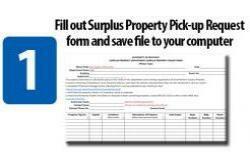 Fill out a Surplus Property Pick-Up Request form by clicking on the image below. Do not change or delete any information in the pre-filled fields. Itemize items line by line. If you have questions regarding the form or procedures please contact the Space and Facilities office. Complete the webform at the bottom of this page by clicking on it. Submit the completed Surplus Property Pick-Up Request form, in Excel format only, to Space and Facilities by uploading to the webform. Do not list items on the swap site without prior approval from the Space and Facilities team. Do not send a capital or non-capital item to Surplus without a property tag. If the item should have a tag please request it from the Space and Facilities office. If you are unsure if an item should be tagged please discuss with your department manager or contact the Space and Facilities office. Do not surplus items that are not on your department's inventory without prior approval. Please note that if the form is not filled out completely there may be a delay in the processing and pick up of your items.